Frank Hill has shaken his money maker to keep this site afloat for a dozen years; longer than any relationship he's been in. He'll tell you "Music is my mistress!" The first hard rock song he remembers hearing is "Dirty Deeds Done Dirt Cheap" coming out of a trailer window. He has a tattoo of an ankh and an ankh in his name and was born on National Metal Day--11/11. Body by whiskey, nachos con pollo and not a bit of plastic to be found. Frank secretly listens to a lot of old Country and Doo-Wop tunes and wants to start a cyberband named "(Hive) Emergence" with lead vocals by Robot Plant. He is still trying to figure out what Judas Priest meant by "paratamize you". If you read this, you know more about him than people who didn't. 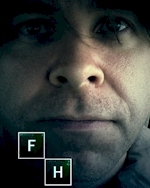 Eric Compton lives in the most haunted city in the world, St. Augustine, Florida with his wife, daughter and two yorkies. 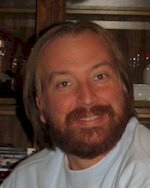 He has served as senior editor for MaximumMetal.com for nearly 10 years and is the author of the heavy metal book series "Denim & Letters". His reviews, interviews and social commentary has been featured on websites like Brave Words, Blabbermouth, Metal Temple, Metal Rules, Ultimate Metal, Metal Maniacs and Wikipedia. On clear, quiet nights...you may hear him screaming from the bottom of the country, "You want Jeff Scott Soto!? I've got Jeff...Scott SOTO!" Originally hailing from Gastonia, NC, Dave's early introduction to Metal was listening to records by Black Sabbath and Kiss. Although there were other bands that caught his attention, it wasn't until he discovered Metallica's Master of Puppets on record at the local public library that turned his world upside down. The rest - as they say - is history. After spending nearly 24 years in Japan and expanding his love for the International underground metal scene, Dave (and family) now resides near Savannah, Georgia. Although he has a true love for classic rock and metal, it's the savage brutality of Black Metal, Death Metal, Grindcore and other versions of Extreme Metal that truly brings out the "Grim Gaijin" in him. Styles Preferred: Black Metal, Death Metal, Grindcore, Funeral Doom Metal, Thrash!! Greg Watson has been hooked on the loud and heavy sounds since the summer of 1994 when he first heard the opening notes of "Operation: Mindcrime" by Queensryche, although according to his mother, he came out of the womb throwing up the metal horns with his pint-sized hand. Since then his tastes have expanded and grown like the ever evolving heavy metal tree of genres. 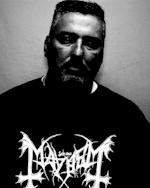 He has been an active member of Maximum Metal off and on for 10 years, contributing reviews, interviews, and a few columns to the content of the site. In his spare time, Greg enjoys deciding the fate of his loyal subjects in the realm of Skyrim and secretly playing air keyboard to "Separate Ways" by Journey when no one is watching. He currently resides in Roanoke, VA with his wife and his metal wannabe beagle. Vinaya is either a writer who dabbles in guitar playing, or a guitar player who dabbles in writing. A Maximum Metal staffer since 2004, he has also served as a reporter for several newspapers in Rhode Island and Massachusetts. Although his obsession with music is such that it does not allow time for much else by way of hobbies, he also enjoys traveling, trivia, photography, British comedy and the occasional A-Team re-run. Styles Preferred: Classic Rock, Progressive, Power Metal, Blues, Fusion, Classical, Neo-Classical Metal...and anything else involving emotion, energy and musicianship. Brad Caplan lives in Charlotte, NC after spending many years in Dallas, TX (originally from Pittsburgh, PA). Brad has spent most of his life accumulating albums, seeing live shows and talking about music to anyone who would listen. He played trumpet for 10 years and has become very proficent at air guitar. Brad has written album reviews and year end lists for MaximumMetal.com and his social network. Originally from the dark Cumberland Plateau of Tennessee, TJ now makes his home in the frozen wastes of Finland. While Chronicling the diabolic music scene in Scandinavia with his photography and reports, TJ also likes to travel to mysterious European locations to discover what horrors may lurk in the unknown crevices lost to the mists of time. Always looking for the moment when the dark gods of heavy metal will arise again from the dark wastes of the abyss to sit upon their throne of blackened bone and tormented souls, TJ is ever ready with his camera to capture that glorious moment. Also I like boobies.